All ages. 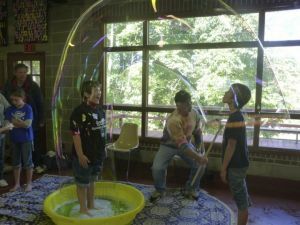 Science teacher, Michael Bever will be demonstrating some amazing properties of bubbles during the “Build a Better Bubble” Show at the Main Library on Thursday, June 1 from 6:30-7:30 p.m. He will show us how to make a square bubble, how to fill a bubble with “smoke,” and how to fit yourself inside a bubble. Our SRP kickoff will be an evening filled with wonder as we watch the demonstrations first and then enjoy some hands on exploration after the show. Find out more about the reading program on the Summer Reading page.